SORRY! This item is temporarily SOLD OUT!. 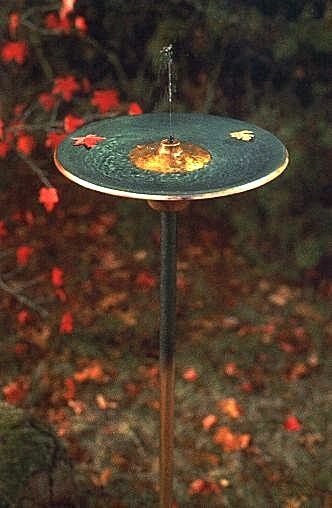 This bird-friendly fountain adds modern elegance to your lawn or garden with its hand-thrown, kiln-fired copper bowl and redwood pedestal. Sunbeams will reflect off the outside of the copper bowl as the fountain fills the inside of the forest green bowl. The mounting pole matches the inside of the bowl. It takes just minutes to assemble, is easy to maintain, and comes with 25 feet of drip tubing, a faucet adapter, and a water pressure regulator. Fresh water travels from the faucet to the bowl, reducing the spread of bacteria. Unlike some common birdbaths, this 12-inch bowl will accommodate only a few birds at once. Dimensions: 12 in. x 12 in. x 48 in.